I'm always fascinated when rare, seldom seen photographs of people or events are uncovered. That's the case with the photo shown here, which you can make larger by clicking on it. Here's the story of this particular photo, using the words of Associated Press writer Melissa Trujillo. Researchers have uncovered a rare photograph of a young Helen Keller with her teacher Anne Sullivan, nearly 120 years after it was taken on Cape Cod. The photograph, shot in July 1888 in Brewster, Massachusetts, shows an 8-year-old Helen sitting outside in a light colored dress, holding Sullivan's hand and cradling one of her beloved dolls. 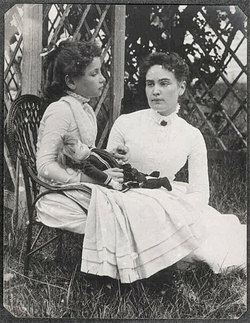 Experts on Keller's life believe it could be the earliest photo of the two women together, and the only one showing the blind and deaf child with a doll -- the first word Sullivan spelled for Keller after they met in 1887 -- according to the New England Historic Genealogical Society, which now has the photo. For more than a century, the photograph has belonged to the family of Thaxter Spencer, an 87 year old man in Waltham, Massachusetts. Spencer's mother, Hope Thaxter Parks, often stayed at the Elijah Cobb House on Cape Cod during the summer as a child. In July 1888, she played with Keller, whose family had traveled from Tuscumbia, Alabama, to vacation in Massachusetts. Spencer, who doesn't know which of his relatives took the picture, told the society that his mother, four years younger than Helen, remembered Helen exploring her face with her hands. Jan Seymour-Ford, a research librarian at the Perkins School for the Blind in Watertown, which both Sullivan and Keller attended, said she was moved to see how deeply connected the women were, even in 1888. "The way Anne is gazing so intently at Helen, I think it's a beautiful portrait of the devotion that lasted between these two women all of Anne's life, " Seymour-Ford said.